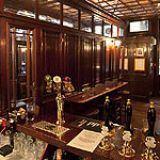 Also known locally as The Jampot, The Jamaica Wine House is one of London's oldest pubs and was originally a coffee house before being damaged in the Great Fire of London. It has a great atmosphere and a genuine olde worlde feel. Do you work at The Jamaica Wine House? What did you think of The Jamaica Wine House? I found the Jamaica Wine House to be a little too smoky for my liking which is such a shame as the surroundings and Jamaica Wine House building are beautiful. This backstreet Shepherd Neame pub does a roaring trade with some boisterous City boys and girls. Found near Bank Station down secluded St Michael’s Alley, The Jamaica Wine House is less wine bar, more old-fashioned inn. 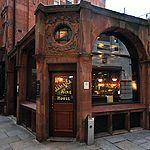 It occupies a corner and if you stumble down the alleyway you’ll find it hard to miss, with its red plaster exterior, branded, iron lantern and wooden door, on which the pub’s name is emblazoned. 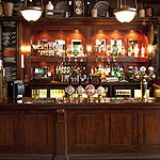 Inside is the kind of traditional and cosy pub you often long to find, especially in this modern part of town. 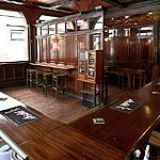 The whole room is bedecked with wood – wooden floors, bar, tables, benches and partitions – giving the pub an antiquated feel. There is ample opportunity to find a little area of your own, as there are plenty of nooks and crannies. Its slightly hidden status makes Jamiaca Wine House a destination for clued up office folk and City boys in the surrounding area. 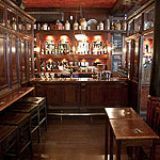 Traditional and old-fashioned pubs of this ilk are hard to come by in the neighbourhood, and so those looking to escape the haughtiness of Bank wine bars, instead choose this riotous wine house. Expect after work drinkers in their droves, getting rowdy and spilling out into the outside alleyway. Staff are easily confused and not quite up to speed, but if you’re looking for a rowdy drink then you’ll be unfazed by this. A simple bar menu is on offer, with burgers being the main fodder here, but it’s fair to say that it’s mostly drinking that happens at The Jamaica Wine House. All burgers cost just £5.95 and come in a veggie variant of falafel and spinach, lamb and mint, Cajun chicken, Cumberland sausage or classic beef burger. Keep an eye out for daily sandwich options, also advertised on the black board, as well as desserts of the day. The name of this pub is quite misleading, as a brisk trade is done on ales and lagers rather than wines, which are left to Todd’s wine bar downstairs instead. The Jamaica Wine House under brewer Shepherd Neame’s guidance, is Cask Marque-accredited, with around seven handpumps on the bar - you can expect ales predominantly from Kent, and the likes of Spitfire, Whitstable Bay and Bishops Finger on rotation. Lagers are also on tap, including Oranjeboom and Asahi as well as more pub lager staples. Wines and champagnes are also available, but you’re probably best off venturing downstairs to Todd’s if in search of something grape-based. It’s always a happy discovery when you find a traditional pub in amongst all the modern drinking spots in the City. Jamaica Wine House is an enjoyable, traditional inn, but don’t expect a quiet conversation over the din of the City boys and girls.